Studies of animal intelligence fascinate me. I’ve just read Dr. Irene Pepperberg’s book, Alex and Me, about her ground-breaking research on avian cognition and communication, focusing on an African Grey parrot she named Alex (an acronym for Avian Learning EXperiment). “Over the course of 30 years of research, Dr. Pepperberg and Alex revolutionized the notions of how birds think and communicate.” This book tells the story of their 30 year collaboration (Alex was her “close colleague” during those years), which ended sadly on September 6, 2007, with the sudden and unexpected death of Alex at age 31. Known as one of the most famous African Grey parrots in history, Alex pioneered new avenues in avian intelligence. He possessed more than 100 vocal labels for different objects, actions, colors and could identify certain objects by their particular material. He could count object sets up to the total number six and was working on seven and eight. Alex exhibited math skills that were considered advanced in animal intelligence, developing his own “zero-like” concept in addition to being able to infer the connection between written numerals, objects sets, and the vocalization of the number. Alex was learning to read the sounds of various letters and had a concept of phonemes, the sounds that make up words. I really enjoyed this book — learning more about Dr. Pepperberg’s ongoing research and about this amazing African Grey. My daughter is a bird person, so I consider myself a bird-grandma to her flock of cockatiels and budgies. She has always wanted a Grey and would be a wonderful parrot parent. Maybe someday I’ll be lucky enough to be a grandma to an African Grey. They are truly incredible and intelligent beings. This entry was posted in Non-fiction on July 11, 2009 by Robin. I love the little birds that your daughter does 🙂 And I’ve always been fascinated by African Greys! I need to read that one! I followed Alex for a few years and was really sad when he died. I absolutely loved what he represented. I’m glad you read this book! I love Jamie’s birds. They are precious. Interesting account of Alex and all the things he was able to do. Truly makes food for thought. I would love to know what animals think. Especially when it comes to my new found love for our kitties who “read” beside me daily. I often suspect animals of knowing more than we give them credit for. Thanks, Chris. 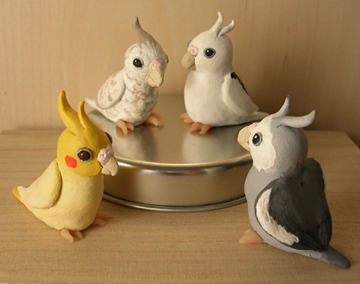 Her little sculptures look exactly like her flock at home! And they’re really tiny…I’ll have to take another photo of them with my Poppet to show you comparative size. And, yes, if you’re interested in African Greys, you should read this book. Kristen, I had only heard a little about him, but was very saddened to hear that he had died. Mom, aren’t they precious! You know how much they look like her birds. Bellezza, that’s so much of what the book is about, that we don’t give animals enough credit. This book was really amazing that way. I love this review! I have long loved African Grey’s. They always have a look in their eye as though they’re trying to figure you out. Fascinating! Thanks, Online Publicist. They are fascinating, aren’t they. Another one for my list! And thanks for the associated links! Jenclair, I thought of you as I read it, knowing how interested you are in brain studies and in communication. I know you’d find it fascinating, too.